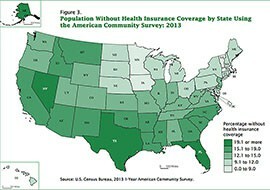 WASHINGTON – The number of uninsured Arizonans fell last year to 17.1 percent of the state’s population, but still remained higher than the national average, according to data released Tuesday by the Census Bureau. The bureau’s American Community Survey said the Arizona drop mirrored a national trend, with the U.S. average falling from 14.8 percent of the population uninsured in 2012 to 14.5 percent in 2013. Arizona’s rate of uninsured fell from 17.6 percent to 17.1 percent in the same period, the report said. Analysts attribute the national drop to everything from a growing economy, to an increase of people in full-time jobs and provisions of the Affordable Care Act that cater to young adults and children. Advocates on the ground in Arizona could not point to any one reason for the drop, but agreed that there is room for improvement. “Seeing the numbers from last year, we do know that there are pockets of the population that we did not get a chance to touch and reach out to,” said Pati Urias, communications director for Enroll America in Arizona. Her organization helps people find public or private health insurance plans. Urias said many of the Arizonans who come to Enroll America for information are surprised to learn they are eligible for health coverage. “A lot of Arizonans want coverage but don’t realize they qualify,” she said. Enroll America started its “Get Covered America” campaign in Arizona and 10 other states last October for the open enrollment period under the Affordable Care Act – better known as “Obamacare” – that ran through March. Not only are they suprised they qualify, but Urias said that by speaking with people around the state she has learned that they are surprised they can afford coverage. Advocates said at least one factor that could lead to a significant improvement in Arizona’s coverage rate does not show up in the Census numbers – the state’s decision to expand Medicaid. Arizona was one of 27 states and the District of Columbia that chose to expand their Medicaid programs as part of Obamacare. The state’s decision last year to expand Medicaid was expected to provide coverage to an additional 300,000 low-income residents that year. Matt Broaddus, research analyst at the Center on Budget and Policy Priorities, said those numbers are not reflected in the 2013 Census data. But he said more recent surveys from the Centers for Disease Control and Prevention and the Urban Institute show the expansion is having an effect. More than 1.6 million Arizonans are enrolled in the Arizona Health Care Cost Containment System, the state’s Medicaid program. Broaddus said the number of uninsured is likely to continue to drop due to a “widening gap” between states that have chosen to expand Medicaid and those that haven’t. The number of people without health insurance fell in 2013, but Arizona's rate of 17.1 percent uninsured remained stubbornly higher than the national average of 14.5 percent.